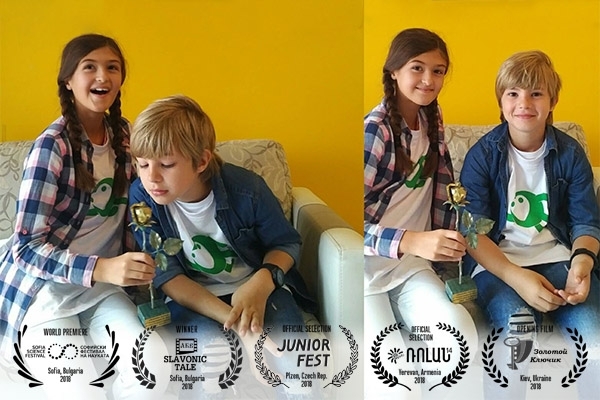 Our starring talents Zornitsa Ivanova (Raya) and Martin Paunov (Tony) with our first award from: VI International film festival Slavoic Tale.The Jury of the Bulgarian-Russian International film forum with President Y. Siaogan (China) awarded "The Curie Case" with a special prize for "Best Children's Film". In August 2018, "The Curie Case" was opening film for the Ukrainian Children's International Film, Theater and TV Festival "Golden Key". At the beginning of November 2018 we are expecting screenings at: 14th Rolan International Film Festival for Children and Young People - Yerevan, Armenia; as well as the 11th International Children's Film Festival Junior Fest - Plsen, Czech Republic.